Will Iran, Syria and Egypt Take Their Cues From Russia? 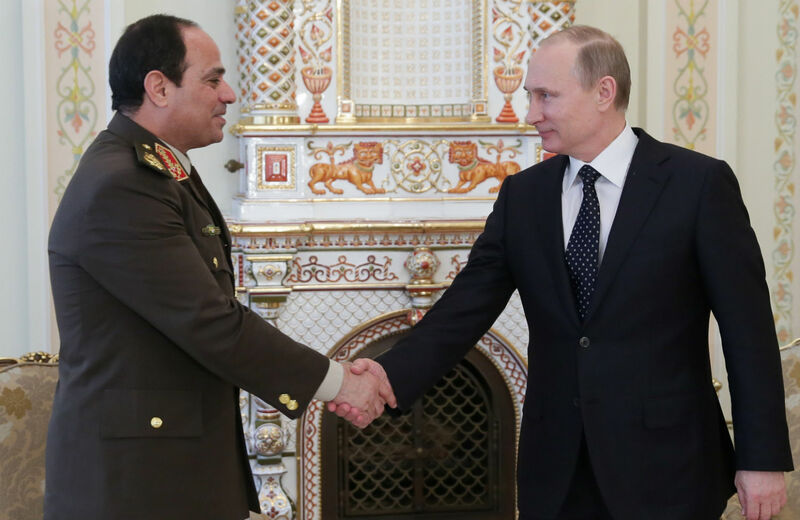 The Middle East's strongmen might not dislike Russia's tough new stand. One of the ugly consequences of Vladimir Putin’s Crimean land grab and the subsequent reaction in the United States and Western Europe is that the chilled relations across the divide could have a dramatic impact on conflicts and controversies in Iran, Syria, Egypt, Afghanistan and elsewhere. In the United States, it may seem that Russia’s actions will make Putin and Co. pariahs in the rest of the world, but among the strongmen and tough guys of the Middle East, that might not be the case. A Middle East diplomat told The Nation recently that during a visit last summer to Russia by the head of Saudi intelligence, Prince Bandar bin Sultan, the Saudi spy chief, told Putin that Saudi Arabia would consider financing arms purchases by Egypt from Russia. Then, in February, Egypt’s ruler and all-but-assured next president, Abdul-Fattah el-Sisi, the defense chief who seized power in a coup d’etat last July, reportedly secured a $3 billion arms deal with Russia that could be the first step toward easing the United States out of Egypt’s military market. Syrian President Bashar al-Assad is taking advantage of the rift between Russia and the United States over Ukraine to press ahead with plans to crush the rebellion against his rule and secure his reelection for another seven-year term, unencumbered by pressure to compromise with his opponents. We wouldn’t like to use these talks as an element of the game of raising the stakes, taking into account the sentiments in some European capitals, Brussels and Washington. But if they force us into that, we will take retaliatory measures here as well. The historic importance of what happened in the last weeks and days regarding the restoration of historical justice and reunification of Crimea with Russia is incomparable to what we are dealing with in the Iranian issue. Some analysts say that Russia has its own national interest in trying to prevent Iran from getting the bomb, but the fact is that Iran is nowhere near getting a bomb. Still, the United States does need Russia to help diplomatically with Iran, and it needs both Iran and Russia vis-à-vis Syria. Among other things, Russia could easily shatter the sanctions consensus on Iran, reopening trade ties with its neighbor to the south. And, in the extreme, Russia could start delivering anti-missile and anti-aircraft defense systems to Iran, including an advanced type that would terrify Israel and perhaps lead hawkish Israelis to demand air strikes on Iran before the missiles could be put in place.